We’re currently looking for a full time web designer/developer with a minimum of two years’ industry experience. Activities include design, development and maintenance of websites, dealing directly with clients – you’ll need the ability to work independently and as part of the team. The applicant must be fully skilled in taking design projects from start to finish. This is a great opportunity for a confident, motivated individual who has the ability to respond creatively and enthusiastically to a multitude of challenges. The position will allow freedom to shape your own role and be part of a highly regarded agency in the creative hub of Leith. We’re a small team with all the flexibility, responsibility and opportunity that goes with it. Working hours and salary are negotiable if you’re the right person for the role. * Good knowledge of design principles, current web design trends and technologies. Hillside Agency is an all-round graphic design agency based in Edinburgh who have been producing high quality visual communication for more than 25 years. We create print design, illustrations, motion graphics, website design, logos and branding, with our portfolio including work for Edinburgh’s Hogmanay, HMV, National Library of Scotland, Rare Management, Danny MacAskill, TweedLove Bike Festival, VisitScotland and Social Investment Scotland. 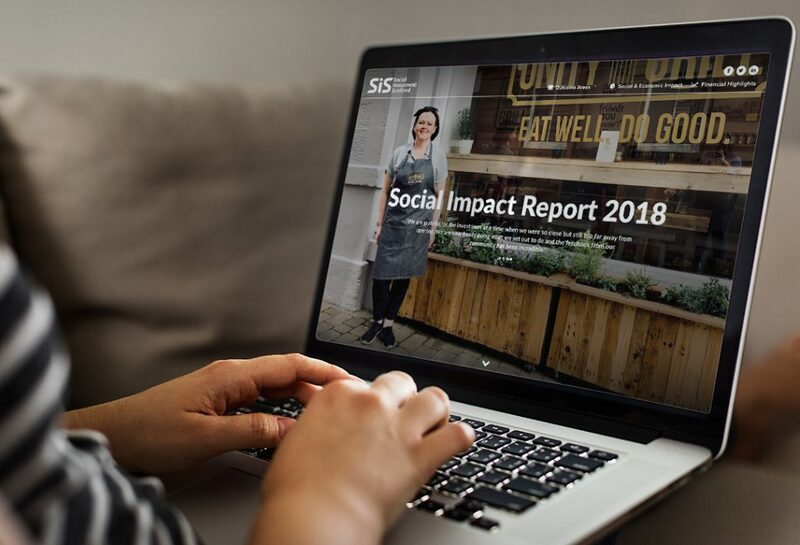 An online annual report doesn’t need to be gimmicky, it can be extremely user-friendly and simple, with clear navigation that allows the readers to access the content more easily. And it opens up for the opportunity to feature video content and animation, which will bring more life to the report. Here’s the most recent one we did for Social Investment Scotland. Go to website. We had a busy start to 2019, giving full design support to a new winter festival in Edinburgh; Burns&Beyond - a six-days celebration of Scottish culture from Burns to now (22-27 January). We started the creative process at the end of 2018, working closely with the team at Unique Events to invent a festival name, logo and overall design theme. With a wonderfully mixed programme (whisky speed tasting for one) we needed a design format that could hold lots of information without looking cluttered and confusing. The ampersand in the logo also gave us an opportunity to tie Burns to the many different festival events. The design was applied to multitude of formats and purposes, including website, social media, posters, adverts, leaflets, outdoor signage and on-site branding. We were delighted to hear that event was a great success, so hopefully this newbie festival is here to stay. Hillside’s 2018 Recap from Hillside Agency on Vimeo. Happy new year from all of us at Hillside! Here’s a quick look back at some of the work we did in 2018, featuring projects for TweedLove, the National Library of Scotland, Eden Court, Burns & Beyond and more. We’re looking forward to the year ahead! 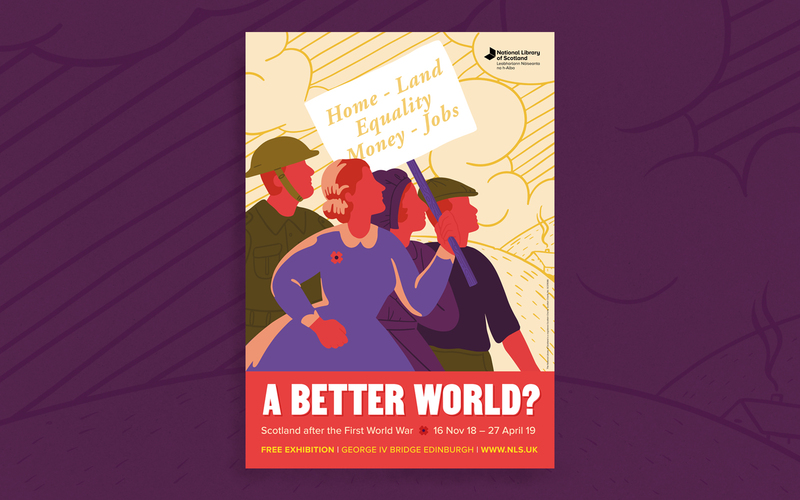 We’re very excited to share the creative we designed for the National Library of Scotland’s new exhibition, “A Better World?” exploring life in Scotland after the First World War. We took inspiration from the illustrated 1920s posters in the Library’s collections to produce this colourful design. A Better World? from Hillside Agency on Vimeo. This year Hillside had the opportunity to give Eden Court Theatre and Cinema a fresh new look for their brochure, and we’re delighted to finally be able to share it! It’s a bold departure from the previous brochure – now a biannual release rather than three times a year, it is twice the length as before. This new design is a simplification; the contents page – once a listing of every show – has been stripped down to the basics, ticket information has been reduced, shows are listed chronologically rather than by genre. Each month has its own section, beginning with a bold opening spread and tidbit of information about Eden Court. These are followed by some highlighted shows, which get more space. Covering six months of performances, we aimed to develop a design with an extended shelf life. See the full brochure here. This month we’ve given a visual identity to a new project from our regular client Social Investment Scotland; the SIS Ventures. The purpose of this fund is to support social entrepreneurs to create and sustain employment opportunities, improve health and fitness, support the homeless and those marginalised within our local communities; all of these activities which are helping shape more vibrant and cohesive communities in Scotland. The Festival Guide for this year’s TweedLove is now out for all bike lovers to enjoy! 100 pages jam packed with info about riding bikes and having a good time. There are several additions to this year’s programme and plenty to choose from for bike enthusiasts of all levels, whether you prefer grit, dirt or tarmac. All the bikes - all the riding! Our latest design project is a full revamp of the seasonal event brochure for Fife Cultural Trust, which we successfully tendered for in March. An insightful and rewarding design process, working with some great people in Kirkcaldy. 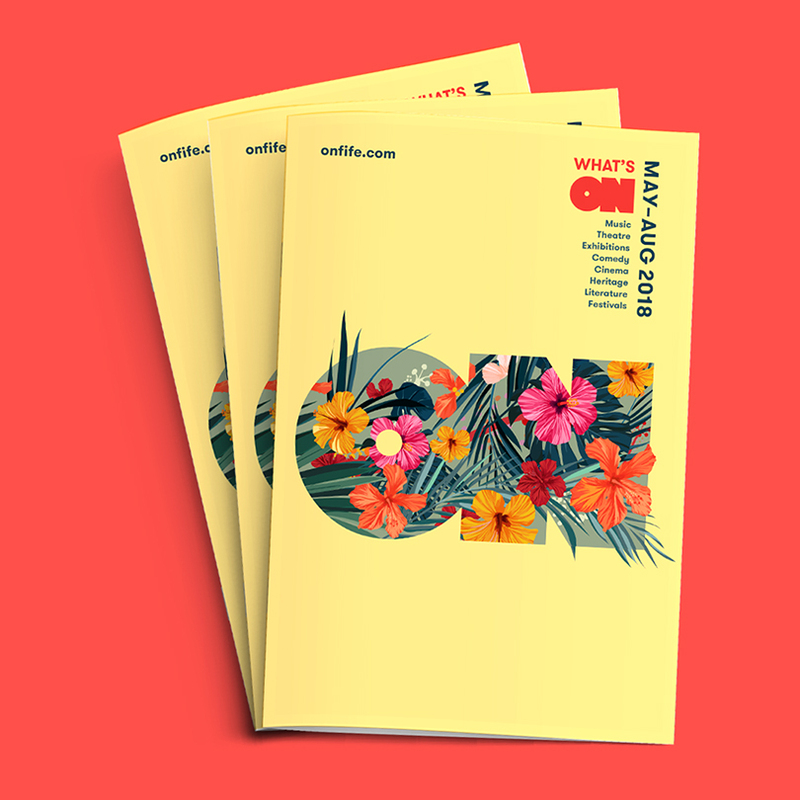 We have developed a brand new layout and colour scheme, and reinvented the ON logo with a bright and inviting floral font cover for the summer issue. The 2018 identity and website for Fort William MTB World Cup is now live! The design is inspired by constructivist posters and references the industrial heritage of Scotland, and sends a clear message that Fort William is the place where bike legends are made! We're currently working on a new website. However, you can take a peek at our temporary folio here.